Mrs Tan Mei Yeng, 86, used to live in a well-lit terraced house in a quiet street just minutes away from Orchard Road. Though she has neither moved nor renovated her dwelling in Lengkok Angsa, off Paterson Road, she now lives in a semi-detached house, nestling in the shade of towering condominium blocks. Mrs Tan and her neighbour a few doors down, Madam L. Wan, 76, are the only two who resisted when developer Bukit Sembawang Estates started buying up all the houses in the neighbourhood for redevelopment. In two separate deals in 2005 and 2006, it bought the 46 other terraced houses in the neighbourhood, building condos in their place. Bukit Sembawang owns Paterson Collection, a 19-storey, 85-unit condo recently granted permission to become serviced apartments, as well as the 21-storey, 102-unit Paterson Suites. It also developed two luxury terraced houses at No. 14 and No. 16 Lengkok Angsa. These houses were sold last year at $6.6 million and $7.5 million after, it is believed, the failure of the last-ditch attempt to get the two women to sell their homes. 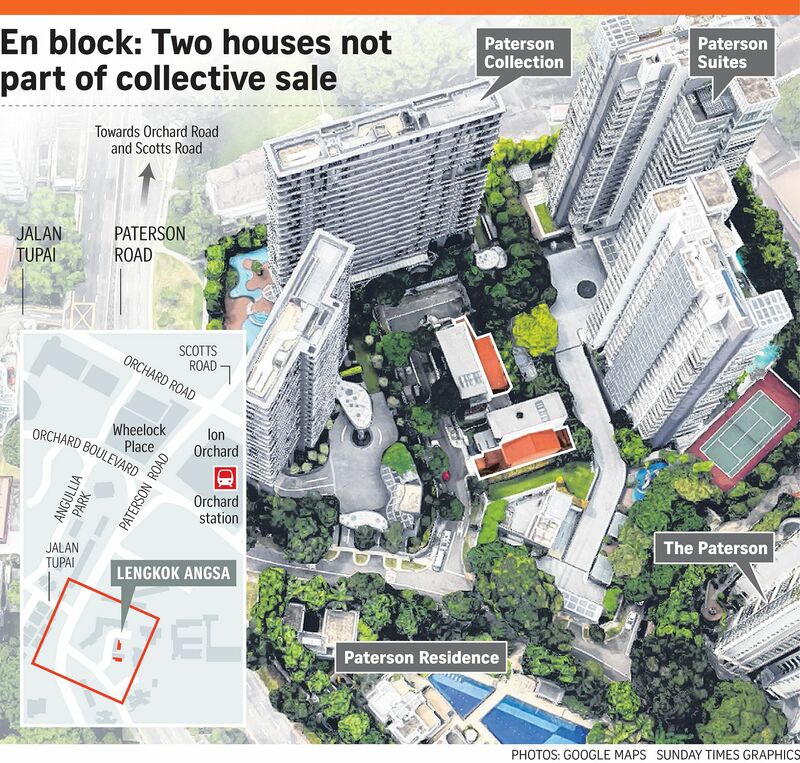 Even as recently as last year, the luxury developer, partly owned by OCBC's Lee family, courted the two women in the hope they would sell their freehold terraced houses at No. 18 and No. 12 Lengkok Angsa. "Name any good hotel, I've had high tea there," said Madam Wan with a chuckle. The women declined to say how much the last offer was, but Mrs Tan's son, investment analyst Tan Chin Poh, said it was "less than $10 million". In the 2006 sale, owners of the 14 homes received around $4.5 million to $12 million per house, more than double what they would have got if they had sold on the open market. Previous media reports said the developer had also hoped to purchase part of the road separating the houses. Amid the latest collective sale frenzy, there have been groups of home owners against such sales, banding together to try and stem the tide, with others writing in to The Sunday Times bemoaning the disruptive nature of these sales. For properties to be sold en bloc, the consent of at least 80 per cent of the owners must be obtained before a sale tender can be called. This means there can be owners who oppose the sale, but have to acquiesce to the majority's wishes. Both women managed to stay because, unlike those living in condominiums, they own the land on which their houses sit. In the process, they became the local example of home owners who stayed and watched the neighbourhood transform around them. But staying put came at a cost. For close to 10 years, they had to endure noise, dust and heavy vehicles in front of their gates. As the houses on both sides came down, and the foundations reinforced, they inevitably found thin cracks appearing in their yard, or a few items, like roof tiles, damaged in the process. "For a while, we were two bungalows," said Madam Wan. Neither woman moved out during the lengthy construction period. Mrs Tan has glaucoma, which affects her vision, while Madam Wan said she wanted to keep an eye on the construction, to make sure her house was "still standing". The avid gardener described her relationship with the construction workers as friendly, but said all the work has affected her flowers and trees. "The plants can't grow like before," she added. She also lamented that she has lost touch with the neighbours alongside whom she raised her two daughters, now in their 40s. "My life is now 10 years shorter," she said with a wry laugh. Still, holding on to the house was worth it. Said Mr Tan: "This was the house where my parents built their family, that my dad left to my mum. It goes beyond money." As Madam Wan put it: "I close my eyes and I still know where everything is." She added: "It doesn't matter how much money you give me, just leave me in peace; let me play with my garden and look after my girls."